Highways and airports have operated as usual for several weeks following major storms that dumped several feet of snow on Connecticut, but commuters on the New Haven rail line must wait until March before service returns to normal. The train system operating along the shoreline uses trains from the early 1970s and many overhead electric lines have been in existence for more than a century. As a result, Metro-North Railroad, one of the nation's busiest commuter systems, has been hit hard this winter, infuriating some commuters waiting for delivery of new trains. "Commuters aren't angry; they're livid." said Jim Cameron, chairman of the Connecticut Metro-North/Shore Line East Rail Commuter Council. Howard Permut, president of Metro-North, said on the Metropolitan Transportation Authority's website that the weather has had a "devastating impact" on the New Haven line. Metro-North has imposed a reduced schedule that began Feb. 7 and is set to end March 4, cutting service by about 10 percent. 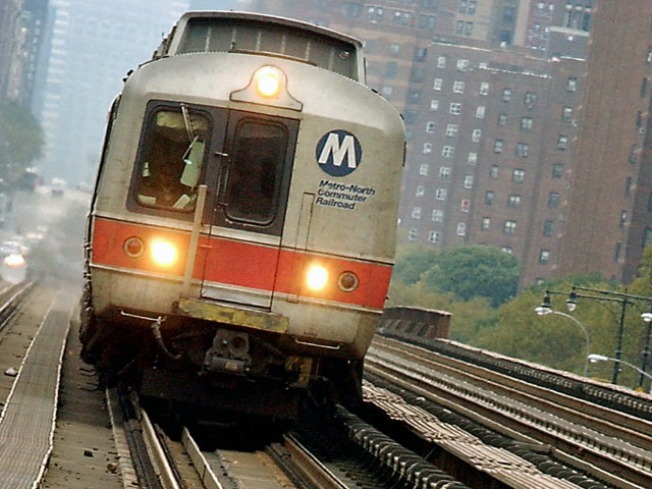 Snow forced Metro-North to pull trains off the tracks and send them to the shop. Because of their design, the trains draw in snow, forcing repairs to motors, brakes that freeze and doors jammed by snow and ice. Nearly 150 cars, or about 40 percent of railway cars, are out of service each day, Permut said. The Commuter Council has scheduled a meeting Wednesday evening in Stamford to air complaints and seek information from Metro-North about its service cutback. "We want those commuters to hear from Metro-North why they did what they did and what they're doing with what they have," Cameron said. Branch lines that feed into the main New Haven line have been particularly affected by the weather and reduced service. Buses are transporting commuters as rail cars are pulled from service, increasing traveling time for Roger Cirella, a paralegal who commutes from his home in Ansonia to work in East Norwalk, from about an hour to as much as 90 minutes. "It's getting better every day because it's warming up and they're fixing the antiques," he said. Gov. Dannel Malloy met Thursday with Permut and said in a statement that the final stage of testing of the new cars, called the M8, is scheduled to begin shortly. He expects the state Bond Commission, which he leads, to approve financing for the final 38 cars. "I'm not pretending this will solve all of our problems - it won't," he said. "But I don't have the luxury - nor do I have the inclination - to wait around and let someone else deal with this." His predecessor, Gov. M. Jodi Rell, launched the state's purchase of new cars for the New Haven line in 2005. Up to 380 cars, at a cost of $2 million to $3 million each, are to be ordered. Connecticut is to pay two-thirds and Metro-North pays the remainder. Twenty-four cars have been delivered, but they must go through extensive 4,000-mile testing lasting more than a year. Commuter activists have criticized the state for the slow-moving delivery of the cars. The first were to be delivered in 2009, but Kawasaki, the Japanese manufacturer, was hampered by production delays. Deliveries scheduled to occur by the end of 2010 came and went as the cars continued being tested. "Where are the new cars?" Cameron asked. "There's a complete lack of transparency and candor on the part of the Department of Transportation and Metro-North." Kevin Nursick, a spokesman for the Department of Transportation, said the agency hoped the first cars would have been delivered by the end of last year but did not promise delivery by then. And even if the M8 cars were in service, they, too, would have been halted on tracks inundated by snow, he said. If testing is completed successfully, new rail cars could be in service in a few weeks, with all 380 on the tracks by the end of 2014, Nursick said. "There is some light at the end of the tunnel," he said. "The cavalry is literally on the way."